Semolina puddings are easy to make. 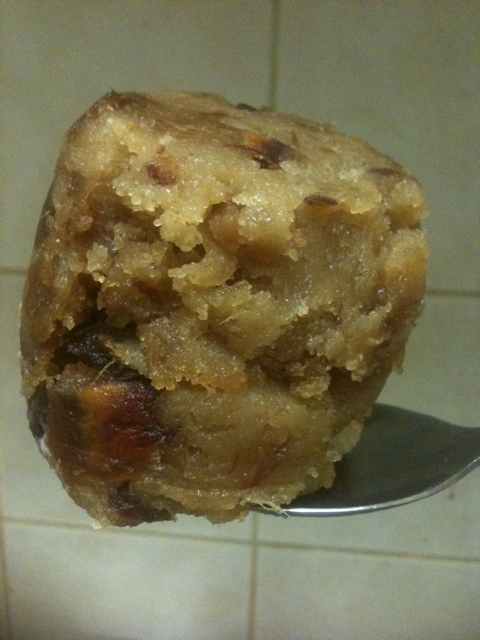 I have incredibly fond memories of Krishnas’ halva, and have always wanted to make it. This is not as good. You are warned! But it is very nom and does the job. In a small saucepan, heat sugar, cinnamon sugar, and water. Stir constantly until dissolved and almost at a rolling boil. Put lid on and set aside. Keep it hot! In a larger pot, melt the butter. Gradually add the semolina and stir until absorbed. Keep it moving to toast it until it’s golden brown. Take off the heat. Stir in the syrup. Be careful! It’ll spit like all hell. Do it gradually. Return to a low heat, and add dates. Stir constantly until it starts to stretch and pull away from the sides of the pot. Put the lid on and let stand for 10-15 minutes. Mould into small pudding moulds (or if you don’t have any, use a thermos lid like I did), and turn out into individual servings. It’s so buttery it will not stick, I guarantee it. I served this with plain organic yoghurt but it would be stellar with hot honey and thickened cream. This would probably serve about six people! Wow! I ate, like, four servings, my DH and a guest had two each, and there’s still some left. Plus it’s kick-arse cold.